The origin of this children's favorite rhyme is sketchy at best. Some say it was written for political reasons; in other words, too much nonsense in politics, imagine that. Regardless, the poem can be found in Mother Gooses' Melody on page 32 online, just for a piece of history. From reading the rhyme you really get the sense that there is a lot of silliness and fun going on. In this lesson plan we give the students opportunity to enjoy the silliness while learning some new words and word families. This lesson is a part of a unit on teaching nursery rhymes. The overview to the series and the rest of the lessons follow at the end of the article, enjoy! Introduce the nursery rhyme,"Hey, Diddle Diddle". Give the students a chance to enjoy the silliness and nonsensical feel of this nursery rhyme. Ask the following questions: who plays a fiddle, who jumps over the moon, who laughs, and what are the dish and the spoon doing? Ask the students to define the word sport in this context (for example, to frolic, play, or amuse oneself). Define the word diddle (to waste time). Ask the students if their parents have ever told them to stop diddling around. Define the word fiddle (a musical instrument of the viol family). The funny part about this rhyme is that it almost reads, like "hey there silly!" Kids will love this. Also, discuss the action vocabulary words in the rhyme, jumped, laughed, and ran. Add these words to the list of new vocabulary words the students are learning through this nursery rhyme unit. Find as many related text to share with the students as possible. Some references are below. Choose two versions to compare and contrast the text, the format and the illustrations. Compile information on a Venn Diagram based on these comparisons. By this time in the series, students should be adept at creating a Venn Diagram. If the students are capable, provide time for them to work in small groups to create their own Venn Diagrams, even if they are pictorially. Point and read to the words in the rhyme. Have the students identify the rhyming words in the text. Where are they located? The rhyming words are diddle and fiddle, moon and spoon. Reread the nursery rhyme. Review the work you have already done with it. 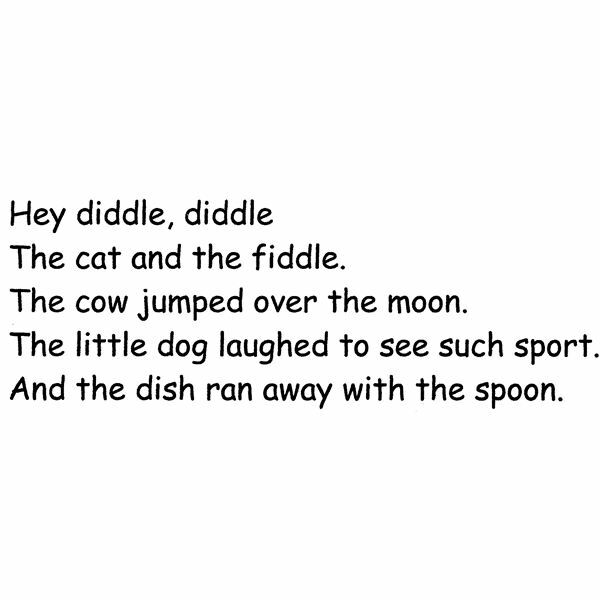 Today, chart the new rhyming words fiddle, diddle, moon and spoon. I have recommended that an ongoing chart of rhyming words be created for this unit on rhyming words. Study the word families. Create a chart of -oon words with the students (moon, soon, spoon, balloon, baboon, croon, loon, noon, toon and so forth.) Create a second chart of -iddle words, for example, diddle, fiddle, riddle, griddle, middle, twiddle and so forth. Each word family should be written out on different posters. Allow students to create their own props that go along with the nursery rhyme (for example, a cat, a dog, a fiddle, a dish, a cow and a moon). Allow them to act out the rhyme with their props. Using the nursery rhyme, have the students find the rhyming words. Have the students create word families of their own. Copy the new rhyming words or the word family words twice on index cards. 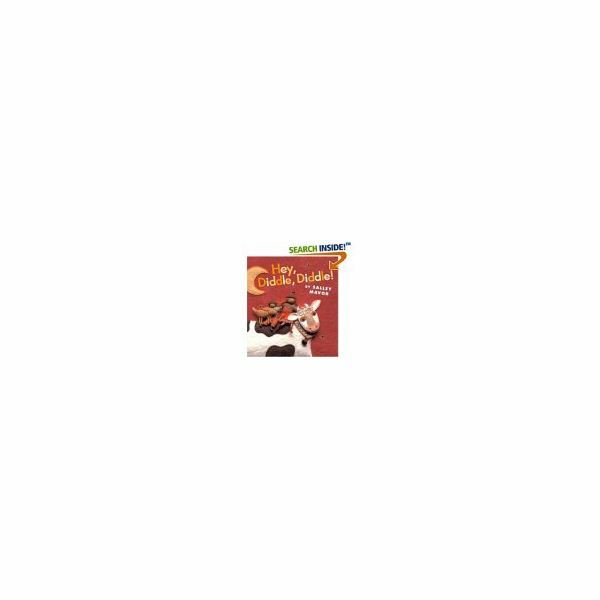 Play a memory game or matching game. Have the students write stories with their new words. Have a group of students read all of the versions you have displayed and talk about them. Put the sentences of the rhyme onto sentence strips and have the students put the rhyme back in order. For a challenge, cut the rhyme apart by each word. Have the students create silly stories too. Give them the starter, Hey, wiggle, wiggle, the ___ and the giggle…. Photocopy, "Hey, Diddle Diddle" and glue onto a page in the students' poetry notebooks. Send them home for the weekend for weekend reading and practice. Storyit.com has a good download of the rhyme because the student's can color the pictures. It is also a good font for young students. Have students also practice finding the words they know. *Note- this nursery rhyme is available to download as a free mini-book. See the first article in the series below (the overview of the unit) for the website. Laurie Patsalides created this lesson and unit on nursery rhymes from classroom experience teaching young students to read.